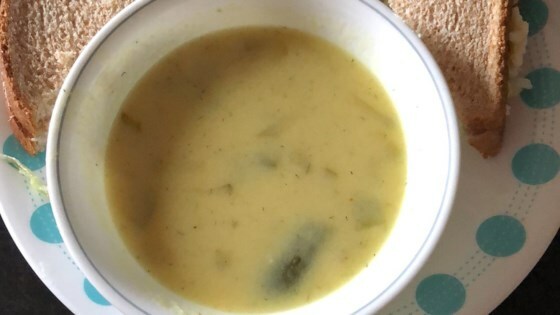 "Finely chopped dill pickles are combined with lots of seasonings in chicken broth to make a very unique soup. This does sound like an odd recipe, but it really is good!" Melt butter in a large stockpot over medium heat. Whisk in flour, and cook until the flour just begins to turn from white to a pale beige, 1 to 2 minutes. Whisk in chicken broth until thickened and smooth. Increase heat to medium high, add dill pickles, pickle juice, sugar, Worcestershire sauce, garlic, onion salt, dill weed, curry powder, white pepper, and bay leaves. Bring to a simmer, then reduce heat to medium-low and simmer for 5 minutes, whisking frequently. Remove from heat and whisk in milk. Remove bay leaves before serving. It was a bit salty. We didnt have onion salt so I used regular salt, but I reduced the salt to 3 tsp instead of the 4 it calls for. Still, I think it was a bit too salty. I was surprised by this soup. I expected it to taste a lot like pickles, but the other seasonings really melded well. I might try to decrease the salt next time, though. Yummy!! I love pickles so its not surprising that I like this soup :D I added some celery carrots and potatoes like some other people had said. Will definitely make this again. This is a real sleeper. Do not let the name fool you. Simple and easy to make. Spicy not for the faint of heart.If the name had a fancy name it would be a money maker in top restaurants.